These transitional months, those between the grand season of summer and winter, or summer and winter, mainly, spring and autumn, are times of significant bloom for many plants either bloom in the beginning of their growing season ( quite common with many orchids, which is why orchid shows are held either in the spring, or the autumn). Such plants bloom very early in the growing season, or near the end because they either require certain pollinators, demand a long season of growth in which to mature, or they simply require strong sunshine or moisture to mature a new annual growth. The reasons why some plants wait until the end of their growth season may seem odd, but if you think about it a little more, many of these plants grow in areas where there are harsh conditions, a hot dry winter, for example, and so it is with many of the species Gladiolus which grow in the winter rainfall areas of the western cape of South Africa. 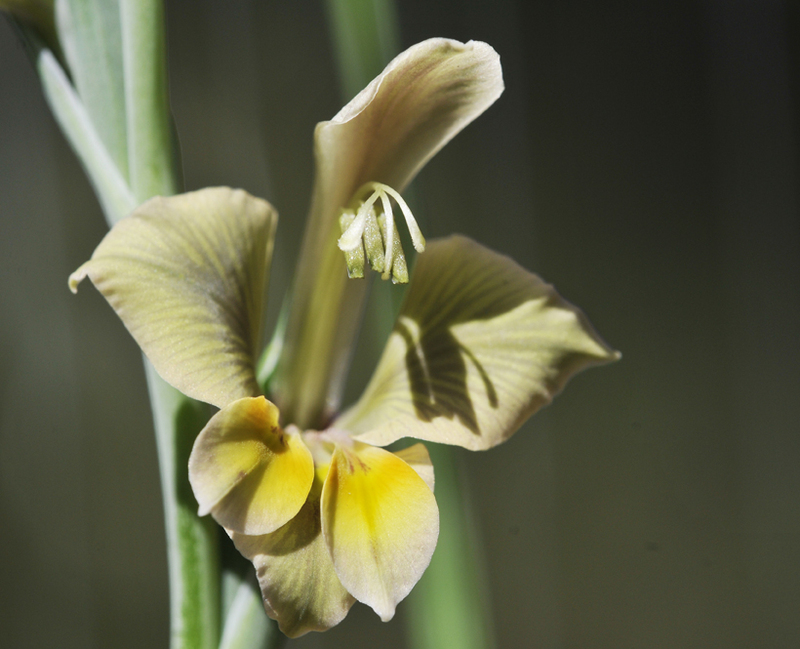 A land, where many gladiolus species come from, and where many of the species in my collection come from. 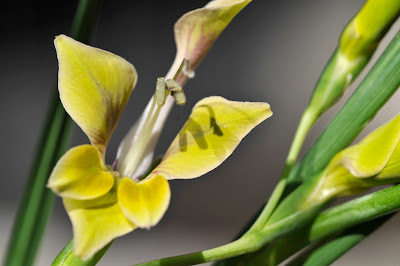 Today, I share a new one for me, the lovely olive and gold flowered Gladiolus virsecens. 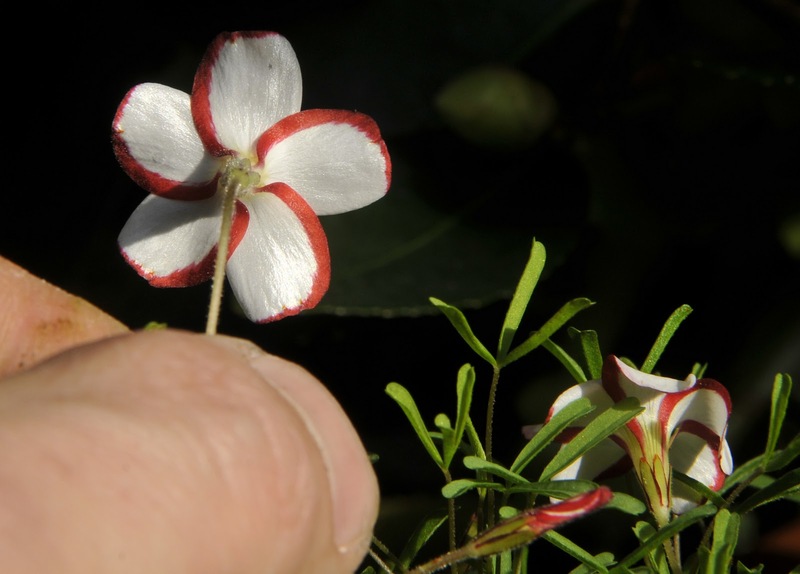 A photo rarely shows the scale of a flower, but these flowers are about the size of a quarter. In the sunshine, when I brought the plant outdoors to shoot it in better light, the color became more intense than those that were shot under the shade cloth. A rather common ( in plant collector terms) Oxalis species in bloom during the Holiday season is Oxalis versicolor, commonly known as the Candycane Oxalis, for obvious reasons. 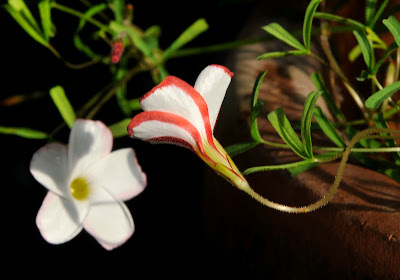 One of the 'bulbous' South African Oxalis species, this is an easy to grow choice for many, and it is also one of the easiest to obtain, often being carried by the larger Dutch bulb sites in the autumn. The flower petals are edged in red, which does not show when the blossom is open, unless you look at the back of the blossom, but when the buds are closed in the evening, or in cool weather, they show a swirled pattern of red and white which is very attractive. When cultivated as a summer grower in warmer climates, or under lights, the foliage will from nice, tight mound, but in weaker winter light, northern grown winter blooming specimens will be more lax in habit. 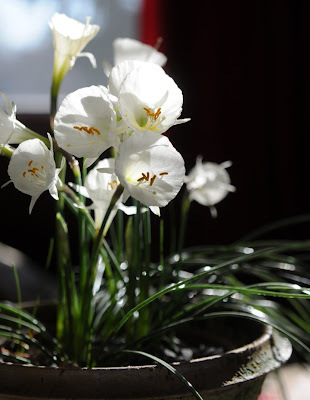 This is bulb that should be planted thickly, for buying one or three will not produce a nice effect. 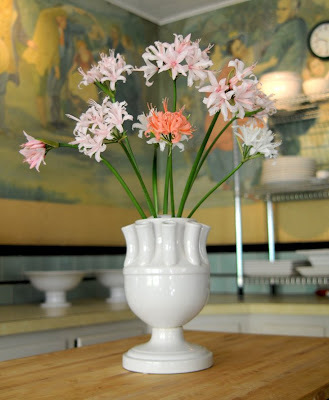 The best results come from dozens of bulbs, planted shoulder to shoulder in a pot ( which can break your bank account at $8.00 a bulb, but don't worry, they will help you- start with five or six bulbs, and let them divide; you will end up with hundred bulbs in a couple of years). 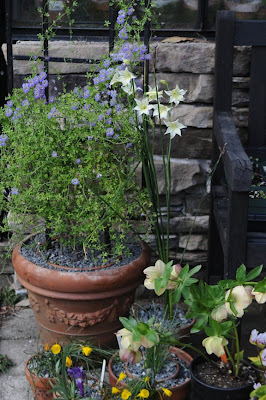 I have found that this is one of those Oxalis species that love moisture when in growth, and although many experts may advise against it, I let my pots sit in water for a few weeks at a time just before blooming, I then get hundreds of flowers. Naturally, one cannot keep plants in foot-bath of water, because the roots can rot without enough air, so I allow my plants to dry out ever few weeks, too. I assume the these plants may bloom in seeps or stream sides in the wild, since many Oxalis that are bulbous in winter rainfall areas are able to survive if not thrive in temporarily flooded conditions that they experience in nature. Just be sure to provide them with a dry period for the summer, where no water at all is applied, I place my pots on a high bench in the dry summer greenhouse when they go dormant in June. Watering starts again in September, when the first cool nights begin to trigger growth, around Labor day, or September 1st. Agapanthus 'Storm Cloud', photographed, after a severe thunderstorm yesterday. 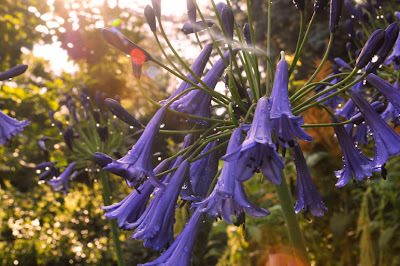 As the heat and humidity ravage the US, forcing lilies to burst and rot, and wilting even the most sturdy of garden perennials, I know that I can rely on the stronger African species to carry through the summer color, for they love this intense weather, and none perhaps more than the The Blue Lily of the Nile, or Agapanthus. Grown in pots and large tubs, our collectios is growing, which means more summer color to enjoy, and the hummingbirds aren't complaining at all ( although, they are fighting over the best, most nectar rich blossoms). 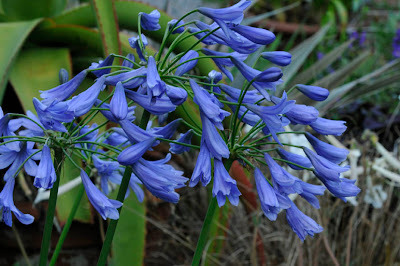 Three Agapanthus cultivars are blooming in large pots in the garden right now. This large, un-named white form which we've had for ten years, and which I've divided into large four tub, and two blue, or violet varieties - A dark, tall cultivar 'Storm Cloud', (at the top of this post), is our darkest form in bloom right now. 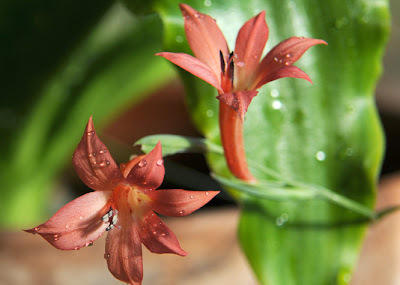 This African native genus with its strap shaped leaves, and tall, magic wand like floral stems, might be a common landscape plant in warmer climates, such as in Los Angeles and Florida, here in New England, it must be kept as a pot plant, grown in large tubs and containers, which must be brought into the cellar, or, as we do, dragged each autumn into the protection of the cold glass house for the winter. 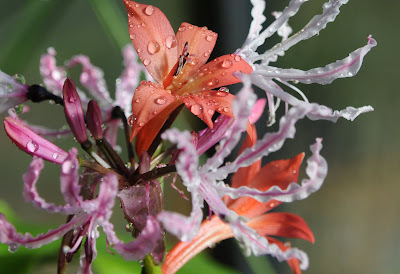 The South African summer growing plant that grows easily and spreads if happy. 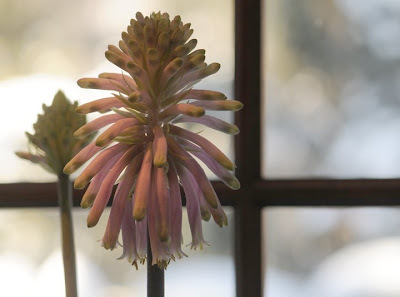 I first tried this cunning little plant ( which is dormant for the entire winter), about twelve years ago after reading about them in the old Heronswood Nursery catalog. Dan Hinkley wrote about how easy this plant was to bloom, and how pretty it looked when grown in low bulb pans, or in bonsai pots. Easy, as long as you can keep them from freezing in the winter, here in the north, I keep my many pots of Rhodohypoxis dry during their winter dormancy, under a bench in the greenhouse where they don't get a spot of water. 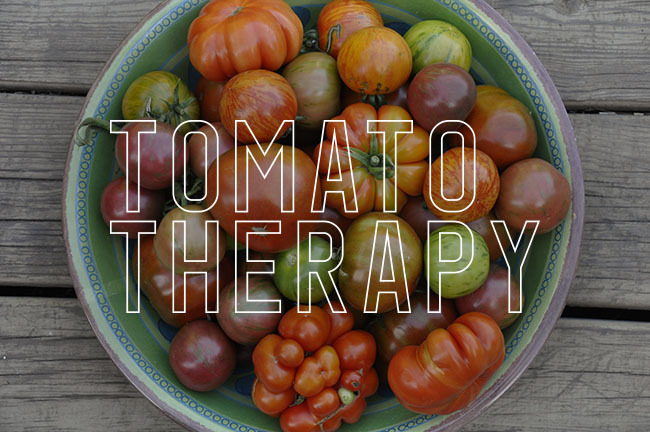 They grow from a tuberous rhyzome, or bulbous, rooty-type thing, and one bulb will quickly fill a pan. About 6 years ago, I ordered a selection from a British grower on eBay, so I have about a dozen clones, in shades of white, pink, cerise, redish pink and some bicolored. As you can see, they spread so quickly in pans, that I decided to just fill some window boxes that I bought at Target with them. Now, they fill four window boxes, which bloom like this for about 2 months, and then remain simply foliage planters for the rest of the summer. 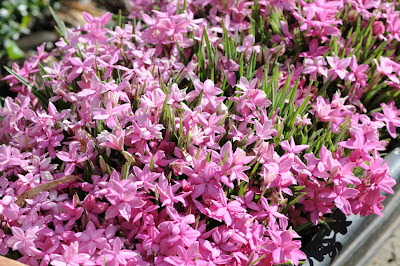 Rhodohypoxis foliage is nice by itself, like well behave grass, it grows no taller than 5 inches, and the containers look like fancy containers with neatly trimmed rye grass growing in them, as if they were Italian designed pots on display at a boutique hotel. Try some Rhodohypoxis if you find some, there is always room for something this beautiful, in an alpine trough, a bonsai pot, a bulb pan, or in a window box. 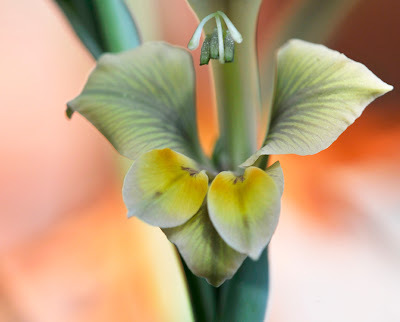 We all are familiar with the common Gladiolus, an all too common florist flower often seen in funeral sprays, or in summer garden shows in bright colors. 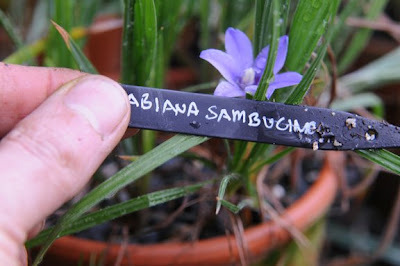 But, there are a slew of wild species available ( mostly from seed) 163 species, to be exact, most of which are native to the winter rainfall areas South Afirca, and most, are pot worthy for a cool greenhouse in the northern hemisphere. I think I am truly becoming addicted to these little known species. 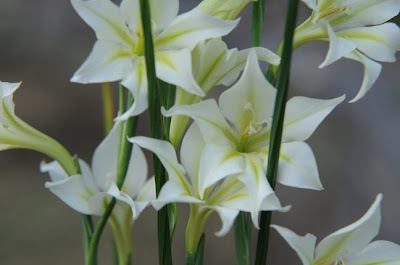 One of my favorites is Gladiolus tristis, a fragrant winter blooming species which will not blooms until March, for us here in New England, but it you live in California, many of these species can be great garden plants. Two years ago, after planting a pot of G. tristis bulbs in September, and watering them, I was surprised with a flower stalk, which arrived just after the foliage emerged. Obviously, a different species of Gladiolus had become mixed up with the G. tristis, and what I had first identified and G. huttonii, I now believe is the fall blooming G. priorii. 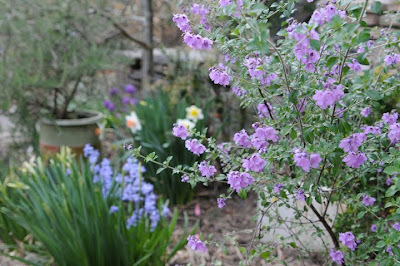 SInce it either blooms in October, or even as late as January, and, they flowers dangle, looking down to the ground. I'm still not certain, but these things are often muddy, since there are few books which show all of the many Gladiolus species, and even fewer that show photographs. I am relying on the web site of the Pacific Bulb Society, which has an awesome site with many member images of interesting bulbs. 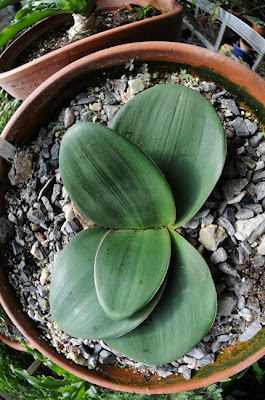 I suggest that you consider joining them, since not only are they friendly and fun, they have an amazing network of growers and fans, who are all very active on line, and in exchanging seed and bulbs of rare and hard to find geophytes. This cold, January morning, I was again, surprised to see a single flower stem of this salmon colored gladiolus, which had nestled itself in a Nerine undulata umbel. With all of the ice and bitter cold outside, these colors glowed in the sunshine that was reflecting off of the snow.Later in the year, this same pot will have a dozen or so fragrant stems of G. tristis, but for now, it brightens this very chilly day, and makes winter more interesting. Some Gladiolus tristis from last year, which bloomed in February and March. As you can see, the entire plant is more delicate and less gaudy than it's showy cousins of which we are so familiar with. These are truly coinnoisseur Glads. THe scent of these G. tristis are beguiling and crazy rich, but only at night. 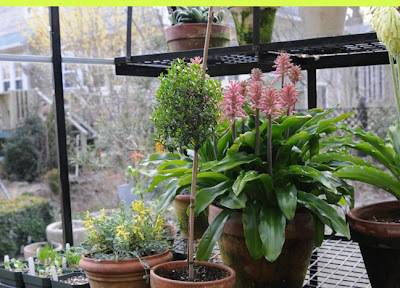 During the day, they are almost scentless, so plan to bring a pot into the house on a cold, March evening. These, are from last year. Gladiolus tristis can be grown, both in the summer, or the winter ( from different stock, either planted in the fall, or in the spring in pots in the north.). While looking in my files for the G. tristis images, I was lost for a few minutes in the folders entitled March. Such fresh images of spring, are so hopeful, aren't they? At least from the snowy perspective of mid January. 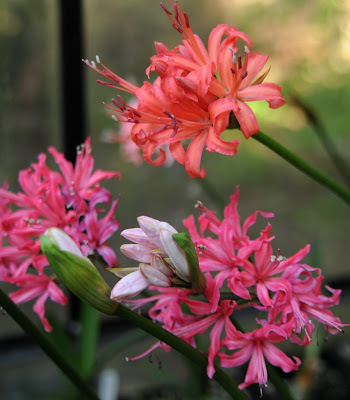 This year, the Nerine sarniensis are blooming incredibly well, with most in full flower as I type this. I have added a few new Exbury hybrids and this one is particularly unusual, especially it's name, which I first thought was an error, until I Googled it, and discovered that Isandwlana is a place in the Province of KwaZulu-Natal, in South Africa. sandlwana, in Zulu, means "something like a little house. " according to a tourist site description. Regardless, at lease I know that this is not an error in my typing! Which, of course, never happens! 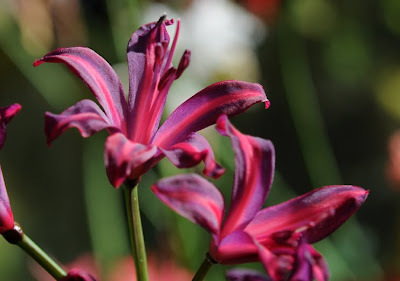 This variety has unusually stripped petals, and, has a stunning pigment of bluish- violet not found in other forms of Nerine sarniensis cultivars. It's color has been difficult to capture in these photographs, so I have tried multiple exposures and in different light levels such as cloudy, sunny, overcast, etc. Still, you can get a good idea of what it looks like. Sorry for the delay in posting, I've been traveling, west coast, Los Angeles for work, and now, home again. Calochortus uniflorus, the last of the calochortus to bloom, is also the tallest in my collection, at 14 inches. These bulbs were planted in pots in September. 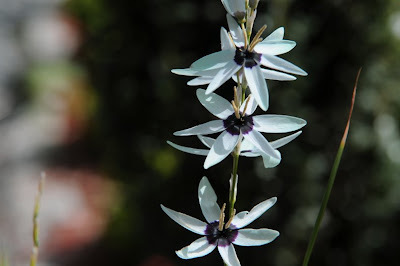 The extraordinary teal color of the South African native, Ixia viridiflora, is very difficult to capture on a camera. I tried a couple of different settings, and locations, but still, the faint teal color washes out. 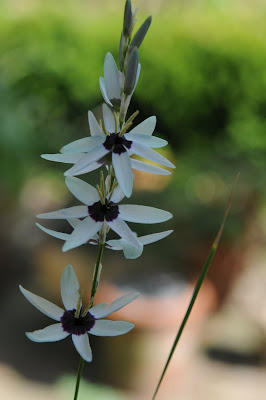 Still, these are amazing Ixia's, and a bulb which had been on my wish list for at least ten years. I am so happy to have a pot in bloom, and to see them waving in the wind. 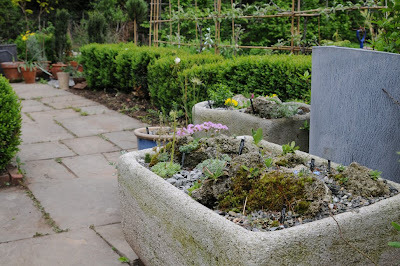 The troughs continue to bloom with alpine plants, on the walk that leads to the greenhouse. Every year I try to add another trough to this walk. 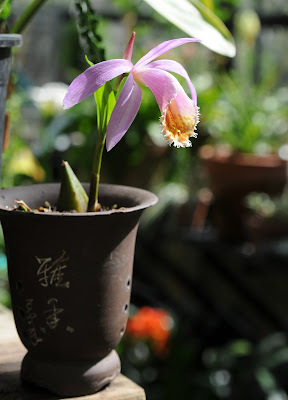 I love Pleione orchids, and although very hard to find in North America, as least the named varieties, I still keep a few, like this one Pleione 'Irazu Mallard'. They bloom before the foliage, and I grow them in a loose orchid mix augmented with fresh sphagnum and beech leaves. 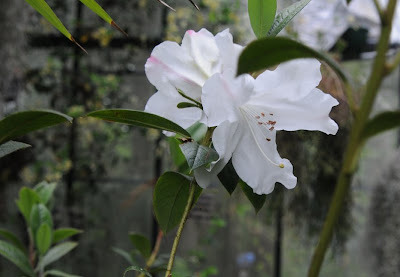 Even as the more common Rhododendrons peak out of doors, there are a few tropical or tender forms which I need to keep on the protection of the hot house, such as this rather weak specimen of Rhododendron fragrans, which I 'rescued' from a friend. I have a new form of this species from Borneo, which has denser growth, but I have to admit that this old form is much more fragrant, but less floriferous. Usually it blooms in January, when one can truly appreciate a nice, scented tropical, but even in May, it holds its own. Pandorea jasminoides, a vine which is growing in the greenhouse ( from Logee's), I almost missed it in bloom, since the flowers are so high in the greenhouse, but joe pointed it out from the deck, and then I could see the flowers and the vine, where it has now wrapped itself around the supports that hold the furnace. This will need to be cut back, unfortunately, but I will wait until after flowering. Ahhhh...The Scent of Gladiolus tristus. For those of you lucky enough to have a cold greenhouse, the species Gladiolus offer some incredible scents and colors that rarely are seen in the garden. These South African natives often require the same conditions that many SA bulbs need, mainly a dry dormancy, and a wet growing season. G. tristus has a strong following, albeit secretly, amongst plant enthusiasts. Old gardening books often romance it's fragrance in ways like this " A pot of Gladiolus tristus when brought indoors from the conservatory, will emit it's haunting fragrance when evening arrives" or " Stepping into a glass house at night, during a blizzard, the scent of the Gladiolus tristis attacks ones senses with the subtlety of a Department Store fragrance clerk armed with atomizer and samples". OR better yet, 'Gladiolus tristus, when brought into the home on a Friday evening after work, and placed in the plant window above ones kitchen sink, instantly transforms the scent of the space, from 'Friday at the fish-fry', into "Friday at the Abercrombie and Fitch mall store." Gladiolus tristis is a bit strong, but oh, so nice. I had trouble finding bulbs for the past two years, looking for them in various catalogs during the summer, for fall planting, but last year, I found some at Telos Rare Bulbs, and purchased 6. One bloomed in October, and was salmon colored, and clearly another ( perhaps rarer) species. 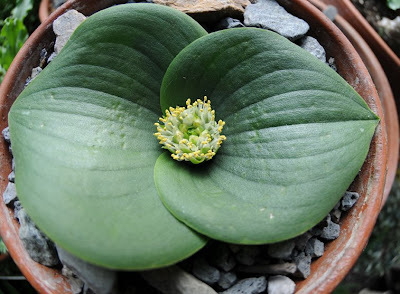 Now, the balance of the bulbs are blooming in the same pot, and they are indeed, tristis. So I shall need to remove said bulbs, and repot this spring. The best discover is that many of the species glads are available for spring planting, for late summer or autumn blooms. So if you want to enjoy this scent, which is rather lovely and not cloyingly acidic as the fragrance of an A&F store, do plant many, 24 or more, in a nice deeply planted clump in your garden. Just be certain to dig them up when frost arrives, and store in a cool, dry place until spring ( unless you live in zone 8 or higher, of course!). I plan on ordering 96, for one, massively fragrant clump. Now, I wish I lived in San Fran. 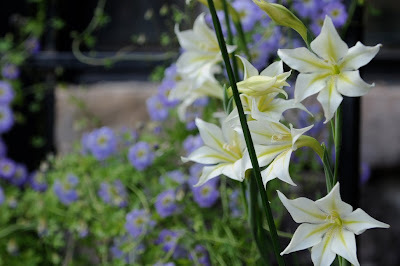 A pot of Gladiolus tristis brought outside with some early blooming greenhouse bulbs. The Velthiemia bracteata are beginning to bloom ( see the yellow flame var. in the upper right hand corner). Their size is different each year, I guess is is a combination of light quality, temperature and water. This year, the greenhouse was very cold, it even froze a couple of times, and the sun was brighter in the front of the house, so these plants received more bright light than usual. I like the shorter habit. Don't believe what they all tell you! 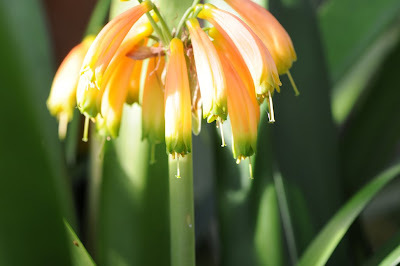 Most South African bulbs look pretty crappy by the time they bloom. This Babiana looks like all of my Babiana, starting to yellow and brown, and then sending up buds. Dang ungroomed baboons, ( Babiana are named after Baboons, who dig and eat thier bulbs in Africa). This was glass cleaning weekend, at least Saturday was. I was only able to wash the inside and outside of 7 rows. These panes were green with algae, but now the sun is strong enough to burn the foliage ( see the cyclamen) so the shade cloth is going up this week. January is becoming busy. I've been trying to catch up with posting, since last week was my birthday ( 50! ), and I had to deliver a keynote speech in Florida, we had two snowstorms, I changed four flights in two days, had the furnace break down twice, and then there is work...and, of course, a new President which I spent celebrating by watching the inaugural on the back seat TV of a Jetblue plane for five hours. Amazing. The Amaryllis continue to bloom, with these two newer cultivars of the "Cybister-type', those with spidery form which are much nicer, I think , than the showier standard Dutch forms which we are so familiar with. The first, 'Rosado' has such a dark center, that it is difficult to capture it's lushness on screen. Believe me when I say that there should be a lipstick color named this. 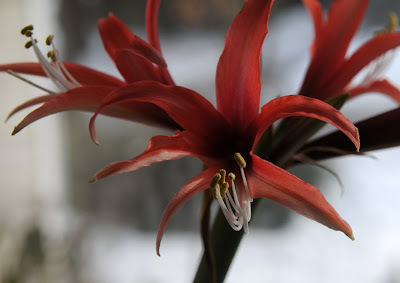 We have received so much new snow ( 13 inches in two days) that when the sun came out on Saturday, the greenhouse literally shrieked with joy ) or from melting ice on the glass) which made the Amaryllis inside, glow so brightly. 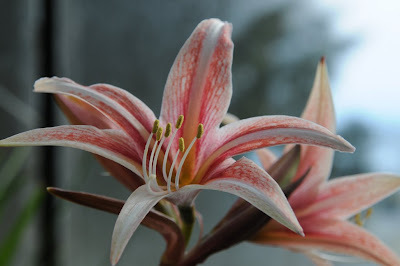 The second new cultivar is called 'Lillian', and it is strikingly gorgeous, it looks more like a Crinum than an Amaryllis, and it's colors are complex and even more interesting when viewed at a close distance. Short post this week, since the tub is running, and I need to pack for another trip tomorrow. Hopefully, I will catch up this weekend, but for now, this will have to do. At least be assured that I am not wasting time, I am busy on-line ordering new plants from the many catalogs that have arrived, especially Plant Delights Nursery. Maybe that is what I will share later - my list. 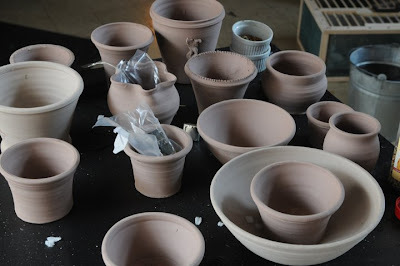 It's a snowy weekend, snowed in and missing two flights, so I decided to fire up the kiln so I can make more pots. These are pretty poor looking, but I thought that I should at least fire them so that I can fire the nicer ones that I threw this winter. Joe was at the National Pigeon show, ( notice the feathers!) so he stored some of the California pigeons in the studio which is wood heated, because of the cold temps outside for a few days. It was so cold, that we lost one of the ducks, the black one named Jack. RIP Jack. I'm sure there will be more, egg laying season will start soon with the Indian Runners. 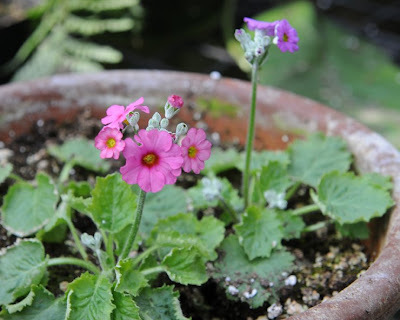 Last image - some of the Primula malacoides seed which I brought back from Japan last year is starting to bloom. Early, and since the house is cold, they are small, but soon there will be more. By next week, the sun will begin to feel warmer in the Greenhouse, and by Feb. 14, I can really feel the difference. 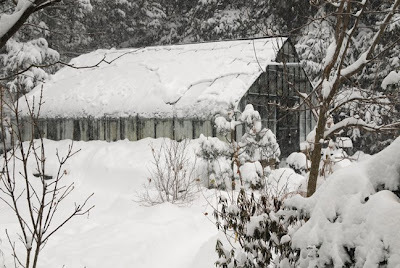 It was a rather mild Christmas day, and finally, the sun came out, enough to raise the temperatures in the greenhouse to near 70 degrees F, opening the vents. This is not unusual for New England, and looking back at other late December photos, I can see my honey bees taking advantage of a warm-ish 40 degree heat wave. This short jaunts are fine for them, as long as they can return back to the hive in time, before the automatic greenhouse vents close. 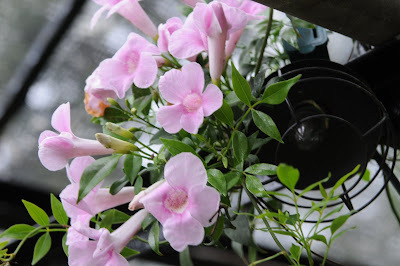 Every Christmas day, I like to take note of what is in bloom in the greenhouse. It's interesting to see what plants bloom exactly on schedule, and which ones take a year off. Certainly there are many reasons, daylength is critical, but then, so is temperature. How many cloudy days, vs. how many sunny days also factors in. 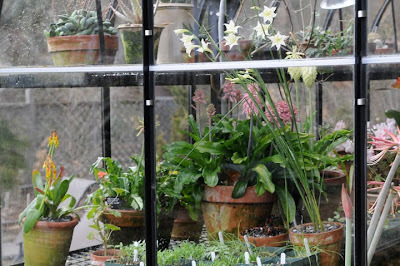 With the greenhouse, one thing is for certain, WInter never feels dead to me, in fact, it is quite alive and vibrant under the glass. The newest addition to the greenhouse bulb collection this year, is the Calochortus species I purchased. I've avoided collecting these bulbs for no reason, other than to save something which I could collect when I am older! Sad, but true. Alas, I could not wait, and although I certainly am 'older'. ( turning 50 in 2 weeks), I am still learning when it comes to plants. 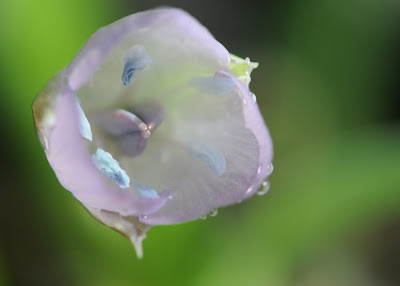 Calochortus is a genus native to North America and the new world, with near 70 species. 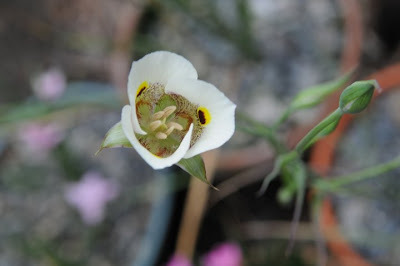 I saw my first Calochortus, not in the wilds of Colorado or northern California, but in the alpine house at Kew, in England, growing in pots. That one June visit, convinced me that I must grow this amazing genus, but the rare bulb nurseries carried so many species, and they were a little pricy, that I would end up making wish lists in the fall, but then never getting around to ordering them, becuase I could not make up my mind once I realized the cost involved. 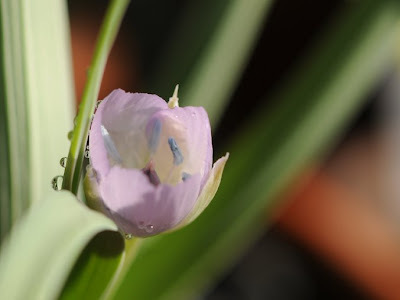 Not that they are expensive, but when added to my Oxalis, and other South African bulbs on my wish lists ( which you can imagine are quite wishy), I simply had to edit, and the Calochortus were the first to go. This year I finally started with 5 species, and the first bloomed on Christmas day. I know that I made one mistake already, I potted my bulbs in small pots ( 6-8 inch clay pots in sandy, fast draining soil). I read later that they prefer larger pots, but since they are plunged in a sand bed, maybe they will be alright. The first species is this lovely lavender species Calochortus uniflora. The stamens are vivid powder blue, which is so different. I think I will order some seed of other species and try growing some from seed, since I am told that that is not that difficult. Some Velthiemia are in bloom also. I received this plant as a gift from a friend who told me that it was the one species of Velthimia which I did not have Velthiemia capensis, but I believe that it appears that the plant is simply the still beautiful, V. bracteata, which is more common, but still nice, although I have ten of them. 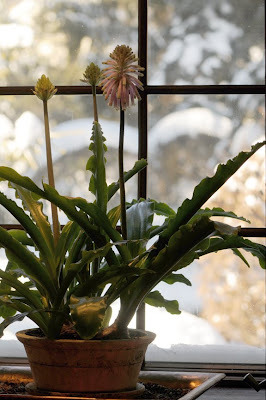 Still, it bloomed early, at Christmas, so I brought it into the plant window for a little South African cheer. 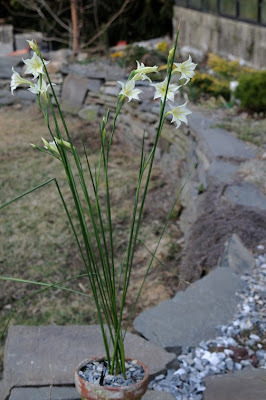 Narcissus romiuxii are still blooming, with many more on the way. Also in bloom, Camellia, Cymbidium orchids, Clivia species, Oxalis species, Vireya Rhododendron, Haworthia, and in bud are many more plants, like the tree aloe that froze last year, a massive green flowered Cymbidum orchid that I recieved as a gift from a supermarket ( Whole Foods) last year, and this year it has 11 spikes! We are all convincing ourselves that winter is almost over, and imagining that the days are already getting longer. 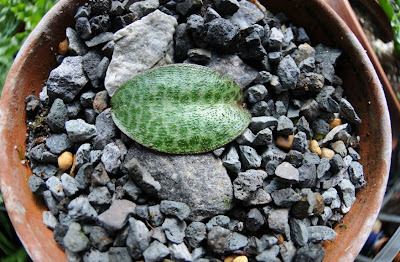 Dormant for one year, this lone, single leaf on a Resnova megaphylla shows how stunning even a single leaf can be. 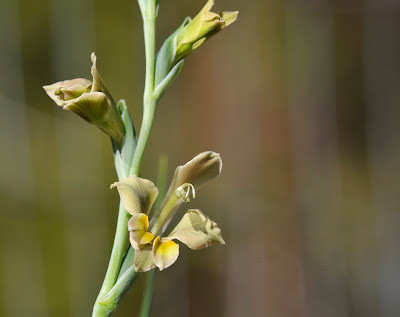 Native ot a specific area of South Africa which has a wealth of these relatives of Ledebouria, these species range from cold climatically severe grasslands in the interior summer rainfall areas of the country to narrow endemics only known from one mountain top. Some species like this are rare and vulnerable to habitat degradation and destruction. This applies particularly to several dwarf species such as this one, known from only a handful of localities on the Mpumalanga escarpment. this tiny bulb finally emerged after a two year domancy with the hope that next year, this tiny rare bulb may actually bloom. Even if it doesn't, the leaf -"although it be tiny, it be cute". The leaves are awesome. Other plants with oddly paired leaves are many of the Lachenalias, which only produce two leaves, and the Massonia, here, a Massonia echinata shows it pair of fleash, ground-hugging leaves, and it's seasonal shaving brush tuft of flowers. The Massonia are quite fascinating, some have pustules on the leaf surface, like tiny blisters, and other species have fuzzy hairs covering the leaves. 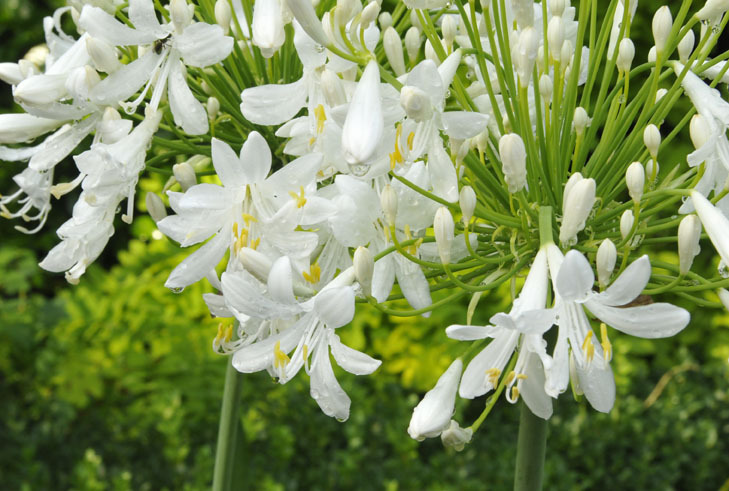 They are all small, tender South African bulbs which each produce only a pair of leaves, and with similar flowers during the winter months of December and January. This rare Brunsvigia bosmaniae, another South African is slowly every so slooooowly growing, in its giant pot of fast draining soild. Dormant for most of the summer, I hope that it blooms in my lifetime! I carefully spends each winter on this sand bed, carefully watered and fertilized, tempting me with the possibility of bloom. IT will probably freeze before it ever blooms, the greenhouse ran out of gas last night, and thanks to a rather unfriendly gas company I use, I had to wait until today to get the tank refilled. We are having problems with our heater, since the greenhouse is kept rather cool, condensation creates an unfavorable combustion atmosphere ( my guess, anyway) so the heater explodes when the gas runs out, and then is refilled. Or on chilly damp days, tomorrow I will spend time on the phone trying to find out what the problem really is. Until then, my not-so-friendly Arrow Gas Company in Rochdale Massachusetts fined me $150.00 for running out of gas, even though they installed a self reading gas meter which does not work, and which I could not read because the locked a cap over it. Nice. 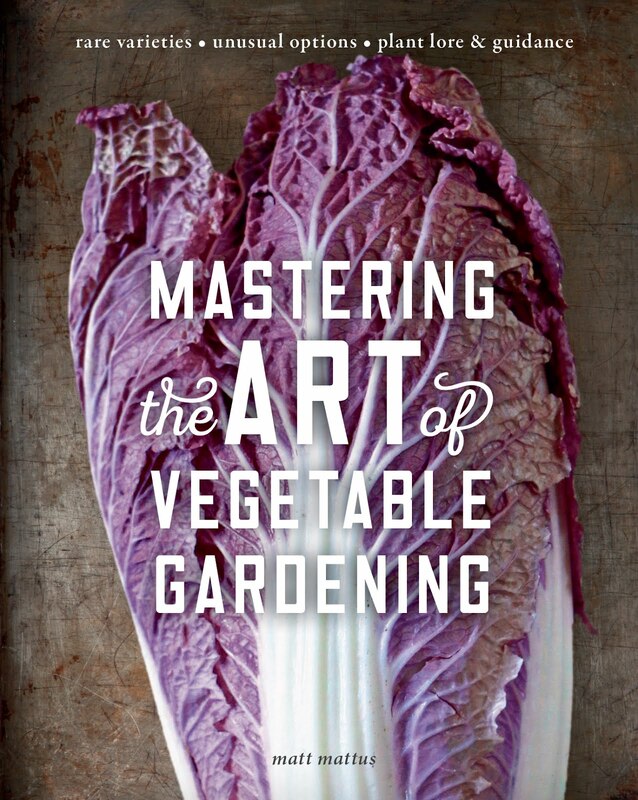 Looking for a great Holiday gift for your naturalist friend? Check out the Cornel Ornithology Lab Above! On this site which offers many creative options that are terrific for both bird lovers and for the birds, you will find such innovative 'green minded' gifts that will surely surprise someone, and delight them, especially if all they were expecting was the typical bird feeder or a scarf from the Gap. If you select BROUSE ALL GIFTS, you will find gift ideas such as a membership to the prestigious Cornell Ornithology Lab, join PROJECT FEEDER WATCH, where a one year gift participation gets bird lovers involved in a more meaningful way. Participants can see how populations are changing, track their their own sightings of back yard birds, and it is fun for most any age young to old. Believe me, my dad does not need another bird feeder! The best part about these gifts is that squirrels HATE them, because they cannot get on line ( but they can run along the power lines!). Um....., Cyber monday get you crazy to buy buy buy?.....then but a gift subscriptione to Birds of North America ONLINE, the must, go-to site for information on over 700 species of birds, exactly when you need it, and there are lots of great ideas for getting your children involved with nature, and birds with BIRDSLEUTH ONLINE, and with Birdsleuth cards, plus home study courses and more. Check it out. 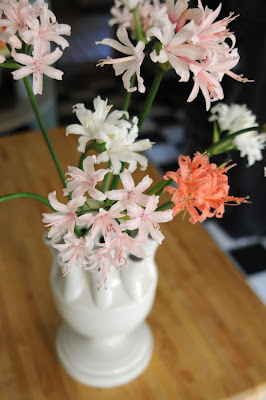 Nerine sarniensis as cut flowers indoors. (The mural in our kitchen was painted by my dad in 1948, it features all of my brothers and sisters, as well as neighbors and relatives in an old English setting. I wasn't born yet ...yeah... obviously an oops baby born 11 years after my sister, who is a baby in the mural; Still, rather weird, but attractive too with it's color palette and cracks, especially when lit well - a little Starbucksy. 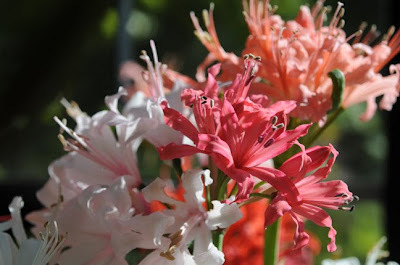 Each year, I hesitate with cutting the Nerine sarniensis since although they are the perfect sign of autumn, and so difficult to grow for most people, if not impossible to bloom, my Kismet of luck keeps me a little more protective with them. Besides, I usually cross them with each other, and don't want to lose out on any seed. This year, since I had an abundance of bloom, I decided to cut a few to take to work, decorate the kitchen and bring into my studio. Here in New England, it was a perfect fall weekend, and nothing says "fall' like pink and magenta, I always say! 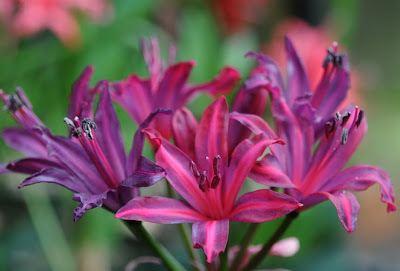 In the autumn greenhouse, the stars are certianly the Nerine sarniesis - the Amaryllis' long lost cousin, rarely seen in America, and unusual even in it's more common habitat - the UK, where the call it the Guernsey Lily, based off of an old legend that a ship at sea dumped its cargo of Nerine in the 1800's off of the coast of Guernsey, where they bulbs that washed up on shore, naturalized. Native to South Africa......wait........? Has anyone ever wondered WHY a ship would be full of Nerine? Perhaps there is a greater mystery here. 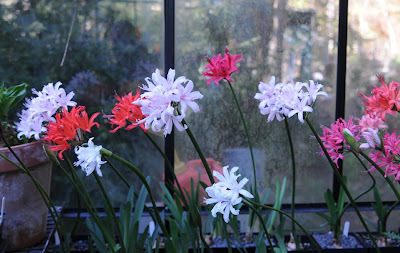 Nerine sarniensis hybrids growing in the greenhouse. ( I know, the ugly old gas can is still in the picture).